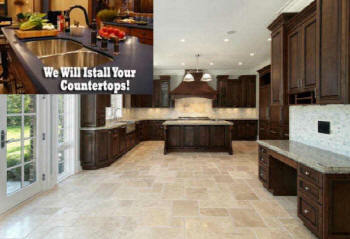 We install Travertine, Marble, Granite, Slate, Quarry Stone, Spanish Pavers, We install Ceramic Tile, Flagstone, Slate, River Rock .We install indoors tile floor installation Tile Floors, We install Countertops, Fireplaces, We install Tile Showers, Bathrooms ..We install outdoors for Swimming Pool Copings, Stonework, Walkways, Waterfalls, Fountains .We seal grout joints and tiles, including already completed work ...Refinishing your countertop will save you more money and time than installing a replacement countertop. Instead of weeks of construction, the refinish will be completed in a matter of hours. Plus, this provides a seamless countertop for a more custom look. We install Tile install ceramic, marble, travertine, granite, glass, limestone, porcelain, saltillo and mosaic tile Local/Near Me showers, tub wraps, We install tile countertops, Tile backsplashes & fireplaces. 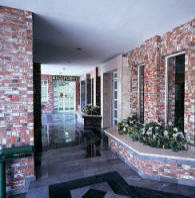 Tiles can increase the value of any home. 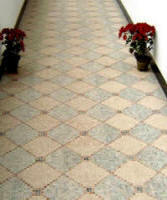 ceramic tiles, mosaic tile, floor tile all add an extra quality to your home. Tile can be found throughout a home from the kitchen, bathrooms, and even the flooring. Tiles are widely available in most home improvement stores and also in specialty stores throughout the company. Finding the right tile for a home with the right color, design, and even pattern can seem overwhelming. But, the results of this project can be beneficial for years to come. Brick tiles are a good floor choice for informal or rustic décor. 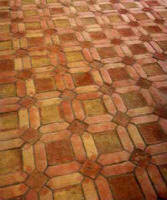 Available in several earth tone colors, bricks tiles should be treated with a stain resistant sealer. 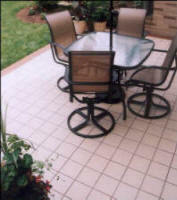 Floor brick is normally used in outdoor settings (such as patios) and can be arranged in interesting geometric patterns. Unglazed — (Also called quarry tiles). The pigment or natural color is present during firing and is part of the tile itself. Unglazed tile needs sealing for stain resistance. Saltillo or Mexican tile is air dried rather than kiln dried. Drying outdoors in the sun makes this tile a little softer and less durable. The exposure to the elements also gives the tile a look that is unique. When used indoors a sealer is required. Terra cotta is the same material in construction and appearance as clay garden pots. 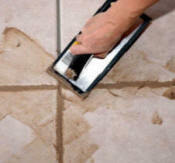 Tiles are absorbent and need to be treated for indoor use. Another factor that you must think about when it comes to bathroom tiles is the pattern of the tiles you will use. There are actually a lot of choices and designs when it comes to patterns of tiles. There are already ready-made tiles from where you can choose from. As is true with tile color, you should also factor in suitability. Will they match the existing colors and theme of your bathroom? If you do not find any tile pattern that will suit the purpose you want it for, then you can have tile patterns that are custom-made for you. Bathroom Floor And Wall Tile Contractors When you’re refurbishing or creating your new house, you will have to look into bathroom floor and wall tile Contractors. Your options are numerous when it comes to this matter and you will no doubt find a lot of different companies to provide you with an excellent service. However, as you only know what exactly it is that you want, you will have to first research everything thoroughly before you can decide on a certain service provider to hire. There are a number of things to consider when starting out, so make sure you read on the subject and collect all necessary information before you proceed. You should check out what each company’s website has to offer, what each service provider promises to deliver and read testimonials to find out how respected they are in the industry. Also, do make sure you check out the gallery photos that might inspire you with Contractors. 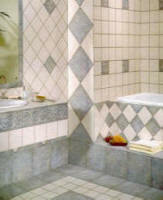 Ceramic bathroom tile is the most common type that is found in the washrooms of most of the households. It is made of clay while other minerals can also be incorporated into the mixture. It is constructed using the kiln firing method which is a method that has been used for many centuries before but still remains the most efficient for this type of tile. Mosaic tiling is not just for the walls of the shower. 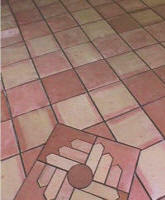 They can also be used to create a beautiful focal point on the floor of the restroom. The trick is to design the focal point so that it is in proportion to the size of the room. You can surround the mosaic design with much larger 36″ x 36″ tiles or with colored concrete flooring. As mentioned, it is made from clay which may be mixed with another material depending on the specific property that you may want the tile to have. The raw material is then shaped into the desired shape and fired in the kiln. Glazing is done to add color as well as to smoothen the surface so as to give it a glass like surface. The glazing also gives it the stain resistant property. ceramic bathroom tile There are plenty of reasons why people prefer this method of flooring. 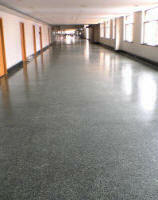 First and foremost it is highly durable and as such it is used in areas where there is high activity. It is also very easy to clean since it is smooth while at the same time it is stain resistant. It is also easy to design thus making it quite attractive and highly suitable for interior decor. 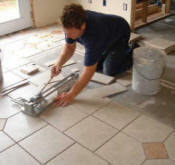 Excellent Small Bathroom Floor Tile Contractors In almost every home in the country, there is a small bathroom. Many home owners struggle with design Contractors for months because they want to find a way to make it look larger without removing all the design elements. 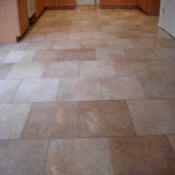 An excellent way to do this is to consider the flooring as one of the main elements in making the room appear smaller. Here are some small bathroom floor tile Contractors to help you get the look you want. Great Tips on How To Make the Bathroom Seem Larger Using Flooring The tips given below are actually quite simple to implement. However, more important is that they focus on one design aspect of the entire room and by changing this aspect, the whole room can appear larger if no other improvements are made.If you want to make your bathroom to look even more interesting, then you should definitely consider trying out some bathroom shower tile Contractors. Your bathroom does not have to be boring. As a matter of fact, if you are one of those people whose favorite place for finding peace of mind is the bathroom, then you should definitely read up on bathroom shower tile Contractors so you can transform your simple bathroom to something that is more interesting and cozy at the same time. 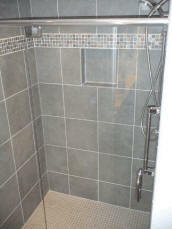 bathroom shower tile Contractors There are actually quite a number of Contractors you can choose from. There are those which have been used time and again by a lot of homeowners. And there are also those which are rarely used only by those who are daring and adventurous when it comes to designing. Popular bathroom shower tile Contractors So to give you a heads up on the popular bathroom shower tile Contractors that are a hit and commonly used by a lot of homeowners and designers, here are some of them. 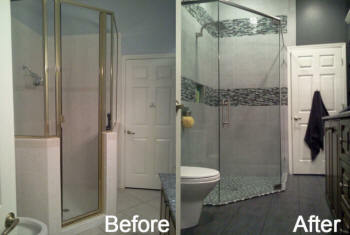 One of the most popular bathroom shower tile design is the glass tile shower design idea. This is especially true for those who want to give their bathroom shower a modern look. There are actually a lot of tile designs that you can use for this bathroom shower tile idea. 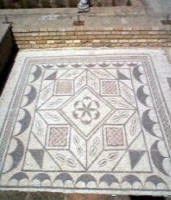 But the most commonly used is the mosaic tile. 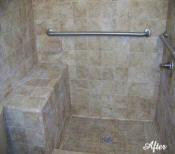 Another option you can try is the granite tile shower design idea. As a matter of fact, this is one of the most popular options. There is no choice that granite by itself is among if not the most popular choice of materials for designing homes or offices. And the same is also true even for bathrooms. But of course, you will have to consider price here because this type of tile can be very pricey. Daring bathroom shower tile Contractors If you do not want to play it safe or popular, then you can try the bold design options. As a matter of fact, these Contractors for your bathroom shower tiles can make a great statement that you can even personalize to express yourself. One option you can try is to use bright colors. This is especially true when you are the type who goes into the shower while you are still half asleep. Using vibrant and bright colors that seem to shout in your face will definitely wake you up. Go with your favorite colors. Go as bold as fuchsia. This definitely goes against the grain because as you may know, the safe and traditional choices for tile Contractors are the neutral, pastel or light colors. Then you just add some dark colored and patterned tiles here and there. But it is definitely rare to find homes using this bathroom shower tile idea. And lastly, there are also those who make their showers like a heat map. This is actually one of the interesting bathroom shower tile Contractors. Basically, this idea uses glass shower tiles that are thermally sensitive. Local Tile Contractors Remodel FREE Quote ➨ Grout Clean Tile Floor Install Local Grout Shower Wall Tile Repair Local Shower Pan Replace Bathroom Tile Kitchen Countertops Local Kitchen Backsplash Tile Seal Re-Grout Cost. Did a Good Job. 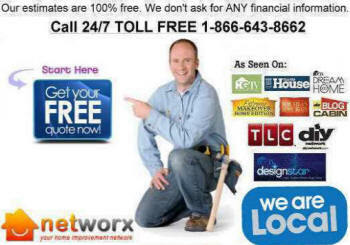 Local Tile Install Floor Contractors Repair Local Tile Wall Shower Pan Install Kitchen Backsplash Tile Walls. 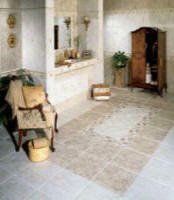 Great bathroom tile Contractors for your home. Shower Pan Installation Installing a shower pan may seem to be a very complicated task to complete and getting a handyman to do the installation could make it very pricy. However, you don’t need to worry because this guide will help you in installing your bathroom shower pan easily and in no time. Just be patient enough to run through each item I’ll be discussing so that you can do the job with the least problem possible. In a shower, the tile shower pan is a necessary component without this piece, you will end up with a big mess and water damage will eat up your home from inside out. It is then necessary that tiling a shower pan is done with precision and impeccable attention to details. 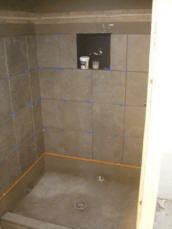 The tile shower pans are the layers of components that make sure that the shower is water proofed. 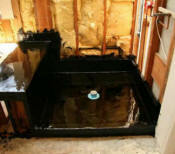 Waterproofing is a key concern in bathrooms. A little bit of moisture can cause mold and mildew, can destroy adjacent surfaces and can cause bigger damages. The tile shower pan installation will vary from one company to another and they will have suggestions for different kinds of works. People will have contradicting opinions about layering the tile shower pan and tiling them but this just gives you a lot of options for your tile shower pan. When selecting the right tile shower pan for your shower, you need to first, make a list of contractors who will be working on the project. They can come in and give opinions and possible plans for the tile shower pan. Each one will provide a specific style and method. It is up to you now who to go to. Of course, it is necessary that aside from the tile shower pan, the contractor should also think about water proofing the walls and ensuring that it has a functional feel to it. A shower that is beautiful can easily be masked by nice tiles and perfect grouting but a shower that is functional has the tile shower pan perfectly placed, the floor angled to the drain, each layer effectively implemented. The tile shower pan is a massive layer that will then be laid down as the finishing touch, the layer that makes the shower a unique place. It is a place where you can remove all inhibitions since you know that it has been made to create that emotion of security for you to feel clean and never think about anything else, just the pleasures made for you. Above all else, you have to be organized to significantly lessen the time you’ll need for the installation process. Beforehand, check if you have the items you will need for the job. You must have a mortar or mortar mix, three membrane liners, trowel, and a screw driver. If you have any of these at home, the better. This way, you don’t have to buy another one and it will save a couple of bucks. The next thing you must do is to choose the shower pan that will best fit your bathroom. Before heading to the store to pick one, you must measure the floor area of the spot where you are planning to place the shower pan. Once you’ve done that, you can now. If you want to make your bathroom to be more beautiful and pleasing, then it would be an excellent idea to read up on possible bathroom tile Contractors for your home. You actually have a lot of options when it comes to bathroom tiles. And in the same manner, there are also quite a number of factors that you will have to consider when shopping. So to give you a heads up, here are some of the factors that you will have to think about when it comes to bathroom tiles. Installing Bathroom Ceramic Tile Designs The best room in the house for bathroom ceramic tile designs is the bath. This room, more than any other, is subject to dampness. Almost all other materials cannot stand up to this kind of punishment without deteriorating and producing mold and mildew. Being in limited supply, ceramic tiles were not always that attractive. Today the variety of types and styles are nearly limitless. Your bathroom can be one of a kind because the selection that you make will be different from any other. 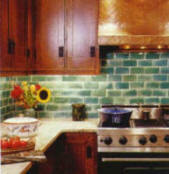 You can make your choice from glazed, unglazed, glass, or mosaic tiles. Many of them can be combined for a look that is truly inspirational. You can limit your choices by keeping the design of your home in line with the tile you choose. A modern decor will lend itself nicely to some of the newer tiles. The period home would be best kept in a traditional style. The use of one color is always nice but it sends no message as to who the inhabitant is and the kind of things they like. White and beige tiles once served a very useful purpose but they have been set aside to make room for the stylish applications of today. 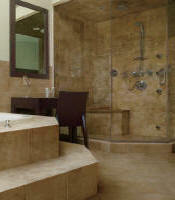 One of the first things to consider when it comes to bathroom tiles is the color of the tiles. Basically, the general rule of thumb here is that you should choose a color of the tile that will match with the other existing elements of your bathroom. The color is also significant if you want to set the mood for your bathroom. If you are the type who considers the bathroom as a sanctuary and place for relaxation, then neutral colors will be good idea. But if you want to add some drama, you can add some colored and patterned tiles to break the monotony. You can create different designs and patterns from these tiles. You can also create borders if you wish so. Thus, if you want to make a collage or specific larger design, colored and patterned tiles are good choices. Color can also make your bathroom look larger. To achieve this, you have to use bathroom tiles with a lighter color or shade. 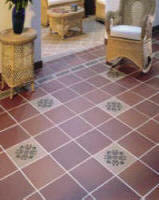 Ceramic tiles are among the very common bathroom floors. They are long-lasting and hygienic. They are just perfect for compact restroom designs since they are capable of creating illusions of bigger space. 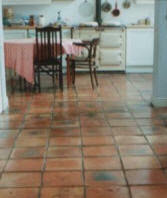 Apart from being waterproof and easy to clean, ceramic tiles are not easily stained. 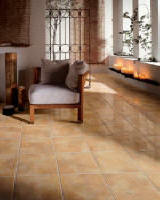 One advantage of using tiles is that they have a wide variety of colors, shapes, textures, patterns, styles and sizes. Some downsides to them are being slippery and often feeling cold underfoot. Also, ceramic tiles are prone to mildew and mold in the points where they are joined. It is not slippery and cannot be damaged by moisture. 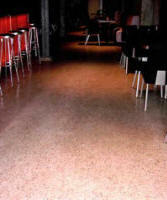 Rubber is also extremely durable and defiant to various elements, although it must be studded so as to prevent slipping. For people who desire style, quality, and luxury bathroom flooring Contractors, stone, marble, limestone and slate are recommended. These options are durable and water resistant. Also, they do not wear out, though in order to prevent staining and coldness underfoot, they may require sealing and heating up of the floors. Local Sunroom Company Install Cost FREE Quote ➨ Local Sunroom Company Build Sunroom Four Season Room Local Four Seasons Sunrooms Contractors Cost To Build a Sunroom | Contractor Add On House Convert Deck Porch To Custom Sun Room Builder Enclose Install Company Cost To Build a Sunroom I Need Find Best Local Four Seasons Sunrooms Contractor Add On House Convert Deck Porch To Sun Room Deck Builder Enclose Install Company Florida rooms, sunrooms, enclosures, greenhouse, sunroom addition, sunroom design, glass sunroom Cost To Build a Sunroom Contractor Add On House Convert Deck Porch To Custom Sun Room Builder Enclose Install Company .